Hydroponic Herb Garden above the Bar at Spirits of York Co.
On Thursday, May 11tth, the Spirit of York Distillery Co. will open to the public offering their unique bottles of vodka and gin premium spirits. The small batches are being created using fresh spring water in stainless steel tanks using only locally-sourced ingredients. The space is perfect for events. 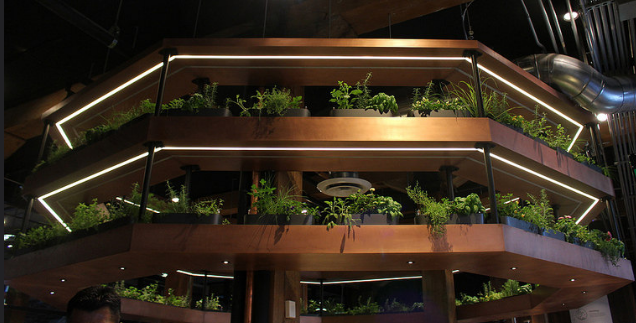 There is a large bar featured as the room’s centerpiece, with a three-tiered hydroponic fresh herb garden directly above it as well as a wall of botanicals and dried herbs used to infuse their spirits. A specialty bitters bar is ideal for interactive demonstrations, mixology training, innovation, and education for others who are as passionate about spirits as Spirit of York Co. is. There are also other rooms perfect for private dining and Team building here is a unique idea for your team. The space fits up to 150 people and has maintained the historic features of brick and beam from the original roots of Toronto’s distillery hub. Like many historic spaces, the venue has achieved a great mix of old and modern, with the lighting design and layout being a key feature. The Spirit of York Co. has brought back the art of distilling to the historic Distillery District with this contemporary ‘Spirits Hub’.